Business success today requires a new depth of customer insight. The ability to segment and tailor offerings to precisely match the needs of customers is a strategic imperative that can significantly impact a company's bottom line. 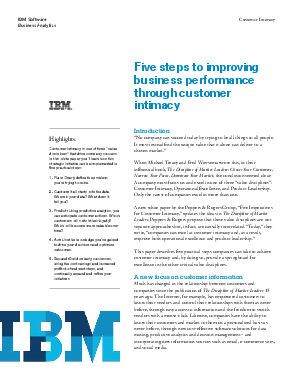 Read this white paper to learn five practical steps your company can take to achieve customer intimacy: 1. Plan your goals, methodology and metrics; 2. Capture the right customer information, including structured and unstructured data; 3. Predict customer behaviors; 4. Act on these insights with relevant, timely offers to optimize the predicted outcome; and 4. Expand successes into other areas.